For more than 70 straight days from January to March, local residents and Arizona visitors are invited to enjoy the work of more than 100 world-class artists at the Arizona Fine Art Expo, most of them local or from the Southwest. 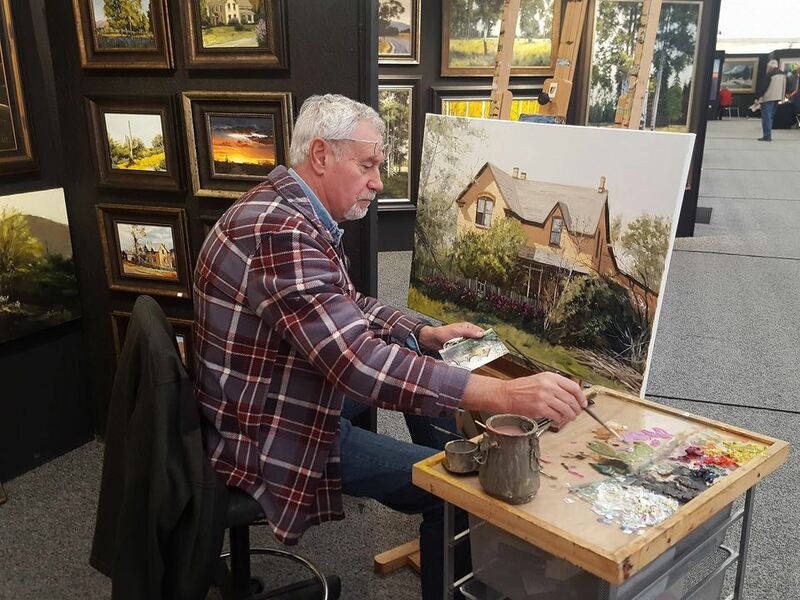 In addition to the displays of fantastic art pieces (oils, glass, stone carvings, metal art, jewelry, ceramics, and more), there are workshops, demonstrations, wine tastings, entertainment, and other events throughout the duration of the show. Past events include cocktail parties, book signings and ice cream socials, just to name a few. Many of the artists are actually creating works of art as you watch. There are various sculptors at this event, and it may take them the entire length of the show to finish one work of art. Please ask permission before photographing any of the art or artists. The best time to visit the Arizona Fine Art Expo is probably during the week and in the afternoon. On the weekends, you can be sure that the aisles are busy. No need to worry about the weather; most of the exhibitors are inside sturdy large tents. Only the two-acre sculpture garden, in the center of the tents, is outdoors. Here you can relax amid more than 100 life-sized bronze and mixed media sculptures. You may also see working areas to observe artists blowing glass, firing Raku, welding metal art, or carving stone. The Arizona Fine Art Expo is open every day from 10 a.m. to 6 p.m. In 2019 the dates for the exhibit are January 11 through March 24. There is a $10 admission charge for adults, $8 for seniors and military, and children under 12 are admitted free. Parking is free. With your paid admission, you'll receive a season pass, so you can enjoy the Arizona Fine Art Expo any time during this exhibition year. You can purchase light refreshments at the Arizona Fine Art Expo, and relax at tables located in the Sculpture Garden. On weekends, live musical entertainment serves as a background to the art experience. The gift shop at the Arizona Fine Art Expo is like a small art gallery by itself. Pick up a souvenir or a southwestern gift for a friend. You'll find cards, shirts, posters, and decorative items for your home. The offered products change every year, so don't forget to stop by. The Arizona Fine Art Expo is located on Scottsdale Road and Jomax in North Scottsdale. The address is 26540 N. Scottsdale Road. From the Loop 101 Pima Freeway in north Scottsdale, exit at Scottsdale Road (Exit #34) and drive north on Scottsdale Road. The intersection of Scottsdale Road and Jomax is just over 4.5 miles from the highway. The art expo will be on your left. It is right next to MacDonalds Ranch. If you have other questions about the Arizona Fine Art Expo, or want to contact the organizers about exhibiting in the future, please visit the Arizona Fine Art Expo online.